Most of us know that fast food and frozen foods are high in sodium. Then there are the chips and other snack foods that tend to be doused in the white stuff. It’s fairly obvious to most people that these foods are high in sodium. But what about other foods that we might not realize are high in salt? Packaged Cereals— Most people realize that packaged cereals are frequently high in a different white stuff—sugar—but sodium content is the other dirty little secret of most ready-to-eat cereals. Be sure to check the sodium content of the cereal you eat. For example, some brands of raisin bran cereal can contain up to 250 mg/cup. Pay attention to the serving size as well. It’s rare that people will pour themselves one cup of cereal. Most people eat more cereal than this in a single serving. If you eat 2 cups of this particular cereal you’d be getting 500 mg of sodium. In other words: a lot. 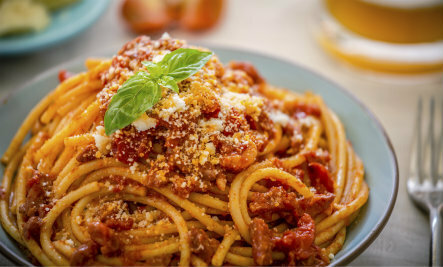 Spaghetti Sauce— Some brands of spaghetti sauce can contain up to 554 mg of sodium for a one-half cup serving. When was the last time you ate pasta with only a half cup of sauce? Probably never. One-half cup of sauce barely coats pasta. Canned Vegetables— One cup of canned green beans contains approximately 332 mg of sodium while fresh green beans contain about 7 grams. Canned beans have 47 times as much salt as fresh beans. And beans aren’t the only canned vegetables high in sodium. One cup of creamed corn can contain as much as 730 mg of sodium. Bottled Vegetable Juice—Bottled vegetable juices tend to contain plentiful amounts of sodium. As an example, bottled vegetable cocktail can contain as much as 479 mg of sodium per serving. Ketchup— Most people know that ketchup tends to contain a lot of sugar, but might not expect to find much sodium in the condiment. Only 1 tablespoon of ketchup (most people use more than that!) contains 167 mg of sodium. Relish— Ketchup isn’t the only condiment that’s high in salt. One tablespoon or relish contains approximately 122 mg of sodium as well. Spice Mixtures— Many spice mixtures contain salt or MSG (monosodium glutamate, which is a chemically-altered amino acid and sodium combination). Some spice blends contain as much as 300 mg of sodium in one-quarter teaspoon. Deli or Packaged Meats— Most deli meats and packaged meats are high in sodium. For example, two slices of beef or pork salami contain about 362 mg of sodium. And, that doesn’t include any sodium found in the bread, condiments, or if you eat multiple sandwiches. It adds up. Teriyaki Sauce— Just one tablespoon of Teriyaki sauce can contain a whopping 690 mg of sodium. Soy Sauce—One tablespoon of soy sauce contains a shocking 1024 mg of sodium! For more information check out WebMD’s Slideshow. Not Lovin’ It: How Much Salt is In That McDonald’s Meal? What Exactly are Twizzlers Made Of? I don't use many canned foods. I buy frozen vegetables, much less salt. Rinse the canned vegetables, that gets rid of a lot of sodium. I was disappointed to discovered that the soy sauce replacement, amino enzymes, has a lot of sodium as well: 160 per 1/2 teaspoon = 960 per tablesspoon. If it's packaged or in a bottle look at the nutritional label. The list is to be seen about how much by the way of added chemicals or toxins and the high volume of added sugar plus the whacking amount of salt/sodium....same thing is horrific. You may was well pour a heap of white sugar or worse artificial sugar in a bowl the add the tablespoons plus of white salt into the bowl too and eat it because that's what's happening and why we get sick and sicker. Cereals you think that are healthy for you and your kids as in Fruit Loops, Cocoa Pops to name two are very unhealthy because of the huge volume of refined sugar and you betcha salt too. I've found there is a soya sauce which is very low in salt but it's still has it in. You've just have start and remember to read the nutritional panel but wait there's more......when you think that product passes muster because you've read the label keep being vigilant because at a given moment some of the ingredients are changed! Therefore that product could become 'suss' again or the specific ingredient change. Just be vigilant that's all I can say and read the panel and understand what means what on the label. Health is just so important especially, not to get high blood pressure put on weight, eyesight problems, diabetes, inflammation that can lead to cancer and so it goes. Ditch the refined foods, preservatives, white sugar, salt and artificial sweeteners and more. Your body will respond well for your better choices!